Bob McCoole spoke at Health Facilities Innovation Forum. 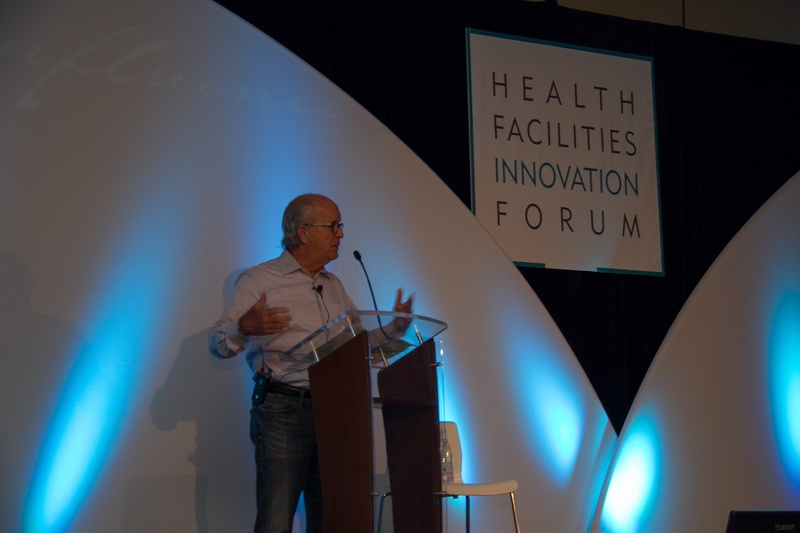 Participants at the 2014 Health Facilities Innovation Forum heard an informative talk by Bob McCoole, Senior Vice President of the Facilities Resource Group for Ascension Health, on the topic of real estate and facilities consolidation and standardization. Simply put, Ascension Health is one of the largest healthcare systems in the country. As McCoole said, Ascension is "about 14 years old, has about 131 hospitals, a couple thousand facilities" and "15,000 beds." Ascension generates about 20 billion dollars in terms of revenue. McCoole shared his experiences and lessons learned to date with Ascension's efforts to consolidate facilities functions. Early in Ascension’s journey, McCoole’s facilities team consisted only of a meager seven people. His group was hardly involved with the real estate and facilities management aspects at Ascension’s ministries. Given the small size of his team, McCoole and Ascension leaned on Accenture for help throughout the process. Accenture provided value in two main ways: they are experts in their field, and they have incredibly useful data. At the beginning, Ascension needed to create business cases and identify how much value they could create. Value was defined as cutting expenses, saving capital on project, and avoiding capital. Accenture helped them through this process. Many deem healthcare and Medicare on an unsustainable path and McCoole felt that facilities needed to do something, even though facilities represent only "8-12 percent of the cost of healthcare." To hear about Ascension Health’s journey, watch Bob McCoole's speech in its entirety below.